Ravens are well-known for their intelligence, they are also very playful birds, performing mid-air acrobatics, playing 'games' with each other's beaks and passing stones to each other (5). They eat a wide variety of food, including carrion, small vertebrates, insects and refuse, yet carrion is the most important component of the diet (6). Pairs stay together for life, and defend a territory from which they exclude all other ravens (5). Breeding begins in February or March. Following a mating display involving posturing, mutual preening and beak caressing, the pair make a solid nest (or renovate the previous year's nest) of sticks lined with moss and mud (5). Clutches contain 4-6 blue-green eggs, one of which is laid each day until the clutch is complete (5). The female incubates the eggs for up to 20 days, during which time she is fed by the male (5). Both parents feed the chicks, which stay in the nest for up to six and a half weeks (5). 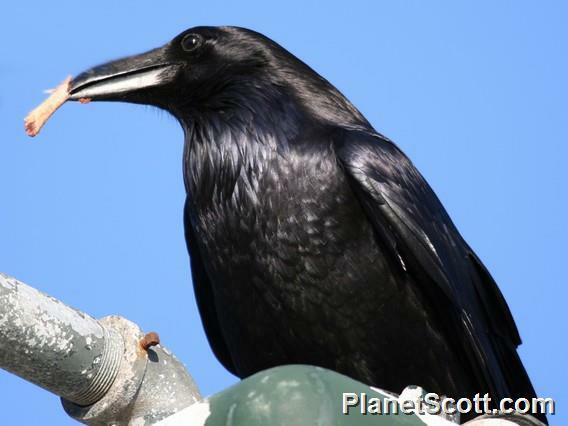 Ravens do not tend to travel widely; during winter adults remain in their breeding territory, and young birds do not tend to disperse further away than 20 miles (5). A rich wealth of folklore and mythology centres on the raven; King Arthur is said to return in the form of a raven, Noah sent out a raven from the Ark to fly 'forth and fro until the waters were dried up from off the earth', and the Norse god Odin had two ravens who flew the world to return to his shoulders and whisper what was happening into his ears (4).